Buy cozy Capri Sets & prepare for sweeter dreams! Boring night styles and sleepwear are a thing of the past! 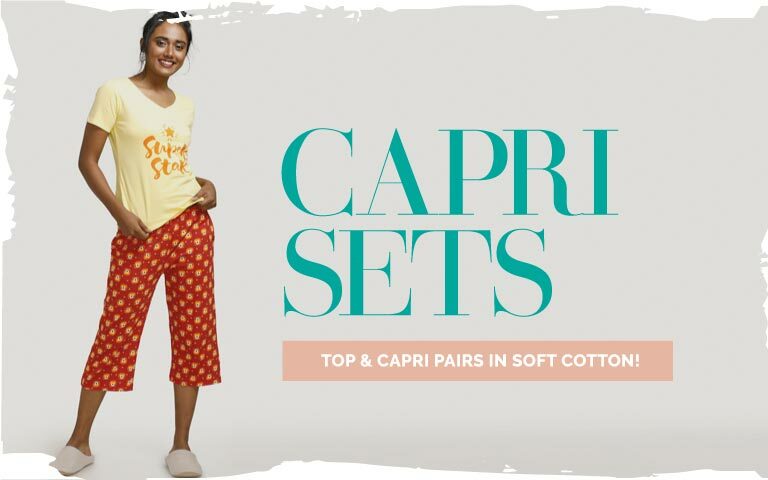 Browse our wide range of capri sets on Zivame. Crafted with the softest fabric that guarantees all-night comfort, these snoozeworthy styles are an absolute must-have. Choose your favourite from a variety of styles and designs, like spaghetti camisole tops or short sleeved tops paired with ankle length capris, in soothing colours and prints. These capri sets are a perfect blend of fashion and comfort. Now, get a good night's sleep with these capri sets by Zivame!